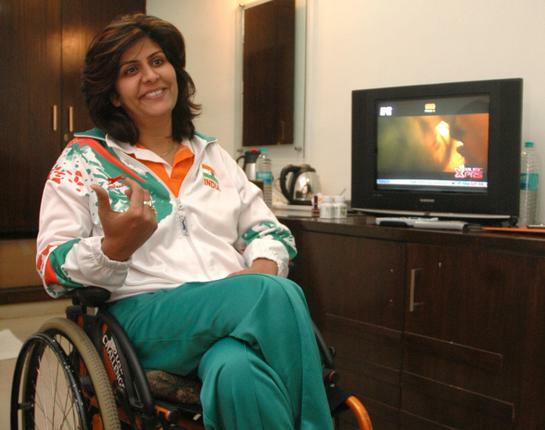 Deepa Malik: My participation in the Himalayan Car Rally 2009 was for two main reasons: firstly, driving has always been my passion and secondly, it was part of the activities of my mission, Ability beyond Disability. The one thing that surprised me was the fact that, in spite of so much growth in mechanical technology, driving possibilities for disabled people in our country are still very limited. Modifying vehicles to suit disabled persons driving is little known or accepted. Getting a driving license and customizing a vehicle of choice is a very lengthy process. Besides I was shocked to learn that till now, the world of motor sports was not open for physically disabled people. D.N.I.S. : Tell us something about your mission Ability beyond Disability. I started doing various outdoor activities. I call myself to be on this mission - Ability beyond Disability. My aim is to change the stereotypical image of wheelchair users that people generally have and sensitize society toward my type of disability. The media is the best way to reach out to maximum people. Coverage of the activities I do help in convincing paraplegics at motivational workshops that a normal life is possible even on a wheelchair! Deepa Malik: There is definitely a lot of change but a lot has to be done still. The media and Internet have brought in a lot of awareness. One thing, which I have learnt, is people look at you the way you look at your self. The day I gained confidence in myself, I realized the society also became ready to accept me. Once your surroundings know that you are not going to be taken for granted, they don't. It has been a decade and I have seen a tremendous change in people's attitude towards me. I have also seen sports for disabled persons gain tremendous support from the Government. Even corporates are coming forward with sponsorships. These are the changes felt on the personal front. But a number of issues are yet to be addressed in terms of employment and equal opportunities, and of course people who are challenged both physically and financially.